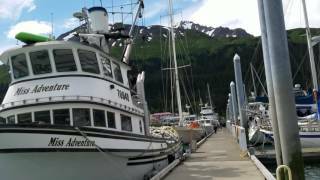 3 good friends "circumnavigating"Alaska by land and water in 17 days. I drove from Napa, CA and my other 2 friends flew from New York and New Jersey to Vancouver BC, Canada. Started early in the morning heading towards Seattle, Washington to stay for a couple of days with my cousins but also was thinking of spending the night in Oregon specifically along the Pacific Coast (highway 101). Btw, the picture is the Grape Crusher, a landmark in this wine country. Mt Shasta is like a "peek-a-boo" along highway 5 North. Suddenly it's there with its imposing peak and still has snow at the top. It has some glaciers about a hundred years ago. One of Washington's spectacular tourist spot. It was featured in "Twin Peaks" a popular TV series. The falls is diverted to a power plant to be converted into a power energy source. A lunch get together which included a peek of Gig Harbor. Met Abe King and my cousins Abe (who is another Abe😊) and his wife Chedz Tumulak. Had to stop here for a travel agent convention for 6 days and to meet my other 2 friends from New York and New Jersey. Girlie and Helen respectively... and to mention my other friend Cherry who is coming only for the convention. Canada Place is where the fun begins. All the tours or most of it are here and also this is the port of entry of cruise ships. The Dept. Of Tourism is also located here. Finally done with the convention. Time to venture to the thrills of Vancouver. 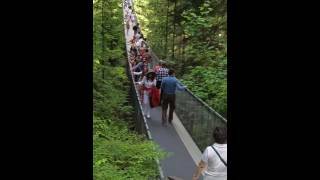 The 4 of us took a tourist bus to Capilano Suspension Bridge which is also a rainforest. Lots of treetop and cliff bridges or walkways where you can hike between trees and cliffs. This is the day we (Helen, Girlie and Me) are embarking on our trip towards Anchorage Alaska. Bye now for Cherry. We were all excited because finally after almost 2 years of planning...here we are. All bags are packed. YEY!!! After a couple of hours of driving, we had a great scenery, so we stopped. It felt so exhilarating to be out here already. Life is not only good but great and most especially because you are with your greatest friends. This snow-capped mountain range is so awesome to experience. We just drove by towards Stewart-Hyder border to see if we can see bears feeding from salmons. 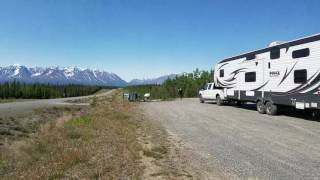 Entering the Border of Stewart BC Canada and Hyder Alaska. This awesome highway and glacier is worth the stop. This is the town that borders on the "the friendliest ghost town of Alaska" Hyder. This town gets busy during the Salmon season but I don't have the feeling that they were so friendly when we went to that soda fountain there. There's only one by the way but the tourist info lady was very helpful. We were told that Salmon season starts third week of June so that why we did not see any bear feeding on salmon. Hyder Alaska is a dead end. You have to go back to Canada so you can continue your trip to Anchorage. 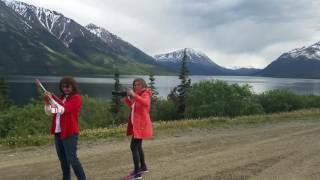 We stopped at Dease Lake BC for the night then in the morning our destination is Fairbanks but I suggested to my friends that Skagway is about 2 hours if they are interested to stop instead of stopping on the way back because we planned to take the ferry to Bellingham Washington. At first, Girlie said no. But she decided to go there after all. 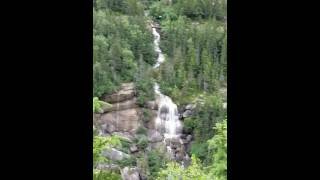 We followed the Klondike highway until we found this amazing place. All we can say it OMG!!! It was even raining a bit which just made the scene more interesting. I recommend this. 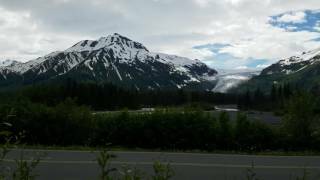 Entering Skagway, spectacular view along this highway. 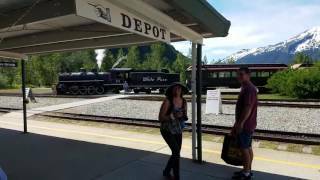 You can see waterfalls, glaciers, pine trees (you can smell it 😊) and even the White Pass railroad where we went for a tour the following day. This is also where you check in for immigration. Our first picture upon arrival. It was our luck that a cruise ship was on the dock. This is one of their stops of the Alaskan tour. Calm and quiet in the streets because it's already 11pm at night. The sun is still up. Serenity at its best...a feeling of isolation but secure. Finally, we reached Skagway at about 9 pm but sun is still up. This is really the first time we experienced "white nights". We have no reservations for a hotel so we just picked one in our travel guide. We got an open hotel at this place. Historic Skagway Inn which used to be a brothel during the Gold Rush in 1896. All the rooms are named after the ladies who entertained the men. Our room was named "DOTTIE". We had our coctails and dinner here. Mojito and Margarita for drinks. Entree were Salmon and King crabs. The dessert was from their organic gardens... rhubab pie Delish! We recommed this❤❤❤. Some buildings are from Victorian era with bright painted colors and decors especially when the sunlights reflects on them. Here's one example. White Pass train tour will bring you to the summit (3000 ft) where gold were being transported. The pass was very dangerous that it was decided to build this railroad. Horses were used to transport gold before the railroad was built. Many horses died in the process. The railroad builder was Michael Heney who said" give me enough dynamite and snoose, and I'll build you a railroad to hell"... and he did in 26 months for $20M. The train ride to White Pass. A passage in history. A funny thing happened when we we tried to leave early in the morning as in early... Woke up 2:30 in the morning we decided to check out from our hotel and did not realize that the border is closed until 6:30 in the morning. So we have no choice except to go back to Skagway and this is what happened. Pls click on the picture for the video play. Passing thru again of this amazing falls. 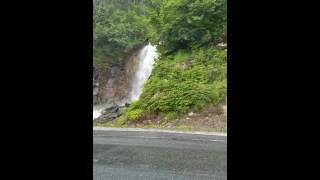 It crosses under the road and cascades along the other side of the Klondike highway. When you ride the White Pass train tour, you will see it too from a far. 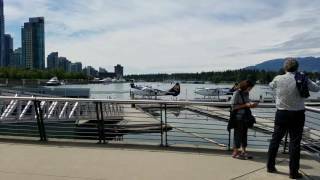 Finally, we are on our way to Anchorage Alaska.Pls click on the picture to play the video. This awesome mountains are all over us. This is approaching Haines Junction. You just have to stopped. Part of the Kluane mountain ranges and St Elias Mountain ridges are so majestic! Incredible sights. Just a wonderful play of clouds and beautiful scenery. Almost to Anchorage. Finally, Anchorage. Visited the Visitors' Information to check out for our fun things to do. One of the Glaciers we visited near Anchorage. It was about an hour drive. The driver and tourist guide was trying to be funny which he succeeded. Pls. clkck on the picture to play the video. A stop over after the Portage Glacier cruise. Saw the bisson, moose, hawk, brown bear. Interesting history of Anchorage and its people. A must-do. A side trip to the zoo but we went before feeding time and most of the animals were napping esp the bears. 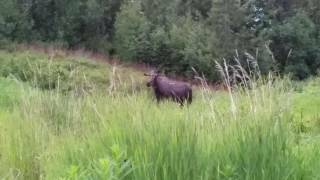 The moose nonchalantly getting on its business of feeding itself. Cruise ships dock here. 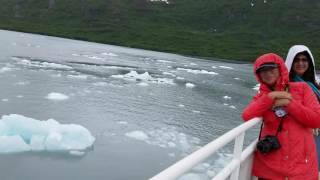 Amazing seaport with the water, glaciers and mountains put together. The camping grounds are just within the harbor. RVs, tents and cars ate accommodated. Went around the resort and noticed the beautiful flowers and very elegant hotel. With my Nephew Raprap at this awesome place. 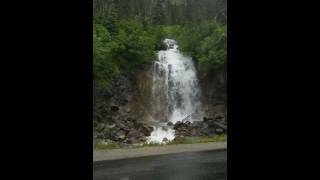 Its about 3 miles off Seward Highway AK-9 then about 8 miles to a parking lot. It was under construction that day. 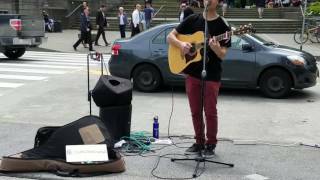 Click on the picture to view the video. I don't know what animal this is. A deer or an elk? Baby elk? 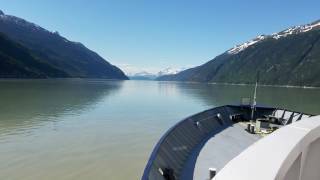 Enroute to Skagway Alaska again to catch the ferry to Prince Rupert BC. This bear was leisurely taking a walk in the highway. Awesome!!! After a mile or two from the other black bear encounter, here's our first brown bear encounter. It's a shame that Girlie is not with us today. She left on the 13th. Love tbe chubby brown bear....huggable....LOL!!! NOT! Kluane Lake is the largest lake within the Yukon. Spectacular view! Will come back here. The road follows the contour of the lake. Click on the picture to play the video. This place is highly recommended. They only open during summer time. Great food. Teeming with a lot of customers. Staff are courteous. 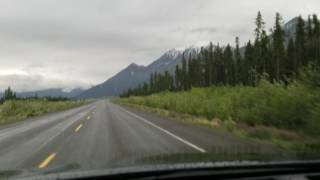 Driving back to Skagway from Whitehorse Yukon Territory. Click on the picture to play video. At the seaport of Skagway with Helen to take a ferry towards Prince Rupert. Ferry's itinerary are as follows; Haines, Juneau, Petersburg, Wrangell, Ketchikan and finally Prince Rupert. It will be a 2-day mini cruise ☺. Just a stop over to pick up passengers and cargoes. Beautiful place! The capital of Alaska. Just stayed in tbe boat because the city is still about 20 miles away. Worried that we will miss the boat. Arrived at the wee hours of 3 am in Prince Rupert and heading towards Kent BC Canada to meet Helen's friend Aurea. The plan is to stsy overnight then head for Seattle Washington. Stayed in Kent BC Canada wth Helen's friend. It was a very nice gathering of friends but have to leave. Brought Helen to Pier 55 and hsd dinner at an Oysters bsr and restaurant. It was a celebration of making it to Alaska and back. FUN FUN FUN it was❤🚘❤🚘🍸🍻⚘. Horses for rent and you can pet them too. Thrse rabbits were bred about 40 years ago and were released to the Cannon Beach community. Heceta Head lighthouse is the most visited lighthouse in the country. It was built on 1892. Beautiful site for a lighthouse. Perfect spot!